Summer is a great time to take your makeup routine down a notch and go for a minimal look. Here's a look at your summer must-haves and what to leave behind this season. There's nothing worse than being in the hot sun and then you soon notice that your makeup has melted onto the collar of your shirt and your mascara is now giving you the dreaded "raccoon" eyes. In reality, you could probably do without both of them and go au naturel in the summer months, but if you're like me and crave a little color and coverage on your face, then go with minimal products for a maximum style that will have you looking perfectly put together with the ultimate summer "glow." In the summer months, less is more. If you usually have oily skin, it can become more oily, and skin that is usually dry, can become oily, making breakouts more frequent when your makeup is too heavy and not allowing your skin to breathe. As a compromise between having too much and too little, try a tinted moisturizer that also contains SPF for the ultimate makeup compromise. A tinted moisturizer will give your skin what it needs to avoid drying out, while also avoiding excess makeup build-up. To find a true match with your skin tone, try Laura Mercier Tinted Moisturizer SPF 20 ($43) which comes in 14 different shades. It blends in like a moisturizer but gives coverage like a true foundation and won't weigh your face down in the summer months. Also, try ditching your liquid concealer and replacing it with a concealer crayon that matches your skin tone and won't leave behind residue or become cakey as you perspire or swim. Try L'Oreal Paris True Match Super Blendable Crayon Concealer ($9) for one that goes on smooth and is easy to apply and blend. I'm personally not a fan of tanning my face. In fact, I do everything I can to avoid the sun on my face, like hiding behind hats and large umbrellas. This, however, will leave me with a pale face while the rest of my body — including my hands, feet, arms and legs — is glowing with a tan from just being out in the sun for a couple of hours with sunscreen. Add a bit of a bronze glow to your face with Rimmel London Natural Bronzer ($5) which lasts all day without budging and looks surprisingly natural and not like you just spray tanned your face. 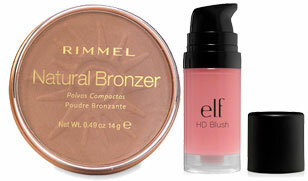 If you prefer to have a rosy glow instead of a tan, opt for e.l.f. Studio HD Blush ($3) which blends in to give you all day, long-lasting color that won't rub off. If you don't already wear waterproof mascara, this summer is a good time to make the switch. Mascara is one of those must-have beauty items that can be worn alone to "wake up" your face without any other makeup present, so it's great to go with one that is also volumizing to maximize the benefit of wearing it. For extra-long lashes with a waterproof formula, try M.A.C. 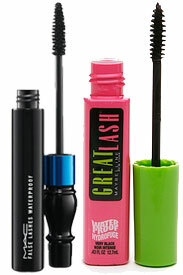 False Lashes Waterproof Mascara ($20) or for a more budget-friendly version, Maybelline Great Lash Waterproof Mascara ($4). You'll have the longest lashes at the pool without the dark rings lying underneath from mascara gone awry. Your lips are one of the most important parts of the body to place SPF this summer. Your lips can easily burn, so adding a little color plus SPF to your lips is the best way to avoid dry, chapped non-kissable lips. Instead of using a matte lipstick, try a colored gloss like Mark. 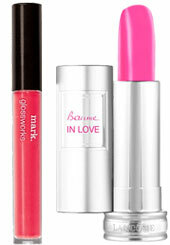 Glossworks Longwear Lip Gloss SPF 15 ($12) for color that stays put without overpowering your soft, summer look. If you're not a gloss fan, try Lancome Baume in Love Sheer Tinted Lipbalm ($26) for a smooth lip tint without the stickiness factor. ^ Remember, the motto for the summer is light and bright when it comes to makeup, and most importantly, don't forget to cover up with your SPF this summer to avoid getting sunburn and sun spots.